Unfortunately the "Back to School with Walmart & Coin Giveaway" offer is no longer available. Dailybreak is exactly what it sounds like; a welcome break from your daily routine. Launching new contests daily, visitors are invited to take a few minutes to play trivia and games, perform brainteasers, interact, and win free prizes ranging from free samples to cash. Companies like Dunkin' Donuts, Budweiser, McDonald's, AT&T and Chevrolet want to be a part of your daily break. Dailybreak makes learning about these companies and their new products and campaigns fun and engaging, and in exchange for the exposure, these companies provide great prizes. Members at Dailybreak can also earn Coins by completing challenges, referring friends, connecting via social media and more. Once they've earned a few coins, members can use them as entries in raffles or to bid in online prize auctions. One of the world's largest producers of meat and poultry, Tyson Foods has been bringing good food to the table since John W. Tyson began selling chickens from his farm in the 1930s. Their brands include Jimmy Dean, Ball Park, Wright, Hillshire Farm, Sara Lee, IBP Trusted Excellence, and many more. You'll find their all-natural chicken nuggets in the oven at snack time, their beef roast kits in the slow cooker on busy weeknights, and their chicken salad in brown bags during lunch hour. Start the school year off right by building a shopping list that includes protein-packed brain foods from Tyson. 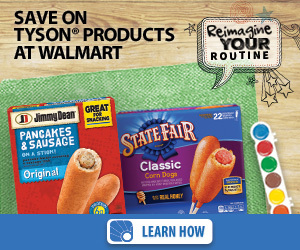 Save money when you choose to shop for your back to school supplies at Walmart. Build your list and you'll be entered to win free coins from Dailybreak.